We're not getting nearly as much out of the global food system as we could, and it's mostly because of the cows. This argument has been made before, in favor of soy or, at the very least, grass-fed beef. We get limited returns on livestock — by most estimates, only about 10 percent of what we feed them ends up nourishing us as meat. It’d be more efficient to get those calories directly. How much more efficient? Researchers at the University of Minnesota Institute on the Environment found that 41 percent of calories produced globally are lost to the food system. Less than half of the total plant protein produced makes its way back into the human diet in plant or animal form. 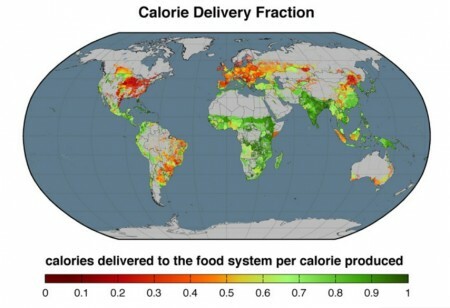 Their study, which is published in IOP Science Environmental Research Letters, reframes the issue in terms of nourishment: They calculate that there are enough extra calories being produced globally right now to feed 4 billion people. That waste is largely concentrated in the U.S., the world’s top supplier of beef cattle, where only 27 percent of plant protein ends up on our plates. Factoring in biogas and other industrial uses for food crops, a grand total of 34 percent of calories produced here are available for human consumption. For comparison, 62 percent of calories produced in China go directly toward feeding people; in Brazil, it’s an even split; and in India, it’s 90 percent. For those who aren’t keen on the idea of going vegan, the study’s authors propose a shift away from beef to the more calorie-efficient pork and chicken, which would feed an extra 357 million people. A traditional vegetarian diet, which still allows for dairy products, would mean 850 million more people could be fed. Moderation, like with the trendy “flexitarian” diet, would go a long way as well: Reducing global consumption of animal products by half would feed 2 billion extra people. With current estimates warning that the global demand for food could double by 2050, making better use of our current system would be a more sustainable way to go.